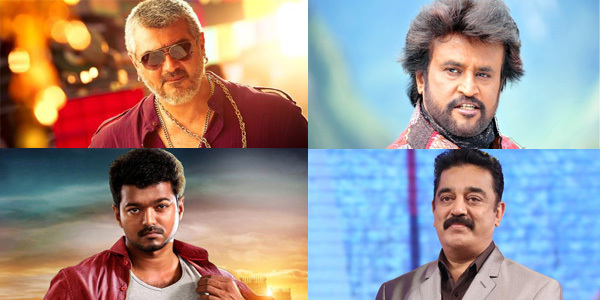 Raaga.com: Thala Ajith overshadows Superstars Rajinikanth, Kamal Haasan and Vijay! Thala Ajith overshadows Superstars Rajinikanth, Kamal Haasan and Vijay! Thala Ajith, recognized as the ‘Monarch’ of box office and reputed for ‘Highest Opening Day Collection’ has lived up to his image with his latest movie VEDALAM. What’s more this time he has left behind even Superstars Rajinikanth and Vijay as his film VEDALAM has collected between Rs 14.5-16 crore, on day one, in Tamil Nadu. The amount is reported to be the highest opening day collection in the annals of Tamil Film Industry!!! Earlier superstar Rajinikanth's LINGAA in Tamil Nadu received the biggest opening day collection of Rs 12.8 crore. It may be noted Rajinikanth had broken the record of young and dynamic superstar Vijay’s movie KATHTHI’s box office day one collection which was Rs 12.5 crore but Ajith’s VEDALAM has crossed all limits and registered a tremendous edge over the two superstars with a huge margin of over four crore. Incredible indeed! And that not all Ajith also gave a run for money to the other veteran superstar of Tamil Cinema Mr. Kamal Haasan. Incidentally Haasan’s much published THOONGAVANAM also released on the same day but it proved a mere pigmy in front of the mighty Ajith’s VEDALAM. Trade pundits reveal the movie could not create much fireworks at the box office probably due to the magnetic charisma of Ajith Kumar's VEDALAM and ended up collecting a petite sum of Rs 4 crore on day one!!! The mad rush of movie buffs in South India could be seen from the fact that both the movies VEDALAM and THOONGAVANAM opened at 4 a.m. on Diwali November 10 thanks to special permission from state government.